For readers with an interest in the small satellite revolution, it will come as no surprise to hear us say that radio frequency spectrums are starting to feel a little crowded. Last week, we covered how entrepreneurial space companies like SpaceX are planning major satellite constellations in low-Earth orbit, and how this influx of new technology will present a significant challenge for regulatory bodies. These proposed networks will all be vying for operational dominance within the already-congested Ku- and Ka-band radio frequency (RF) spectrums—demand for radio spectrum (a finite resource) is fast outpacing supply with tens of billions exchanging hands in FCC auctions every year. While some satellite communications providers are exploring the possibility of “moving on up” to higher-frequency RF bands, like the less-crowded V band, there is another alternative: Skip the RF spectrum altogether and use lasers to downlink big data. Space-to-ground optical communications are just now becoming commercially viable, offer real benefits to satellite operators and their customers, and represent an enormous market opportunity within the evolving satellite industry. Optical (read: laser) communications are an appealing alternative to traditional radio frequency transmissions. When compared with conventional RF satellites, optical communications offer several key benefits. For one thing, enabling RF transmissions requires the inclusion of significant hardware on space-based assets—adding weight, and draining power. By contrast, an optical communications setup is far less bulky and requires much less power to operate: Modern optical communications packages weigh less than a kilogram, and consume under 20W of power. This translates to lower launch costs for satellite operators (since the price of a ride to space is most often calculated based on weight) and a longer operational lifespan. Crucially, optical communications are also higher bandwidth, meaning that larger amounts of data can be sent from space to Earth. This higher throughput is increasingly important as more data is being created and transmitted from space-based assets. High-bandwidth applications, like the images sent from NASA’s Mars Reconnaissance Orbiter (MRO), could particularly benefit from laser downlink capabilities: The MRO’s maximum data rate is about 6 Mbps (megabits per second), which means it takes an hour and a half to send a single image back to Earth. If the MRO were outfitted with a laser communications package, it could beam an image to Earth within five minutes—and that’s assuming a modest optical transmission rate of 100 Mbps. For perspective, today’s laser communications terminals are being designed to transmit at multi-Gigabit speeds, meaning that even high-definition images and other large data files can be sent from space at an unprecedented rate. 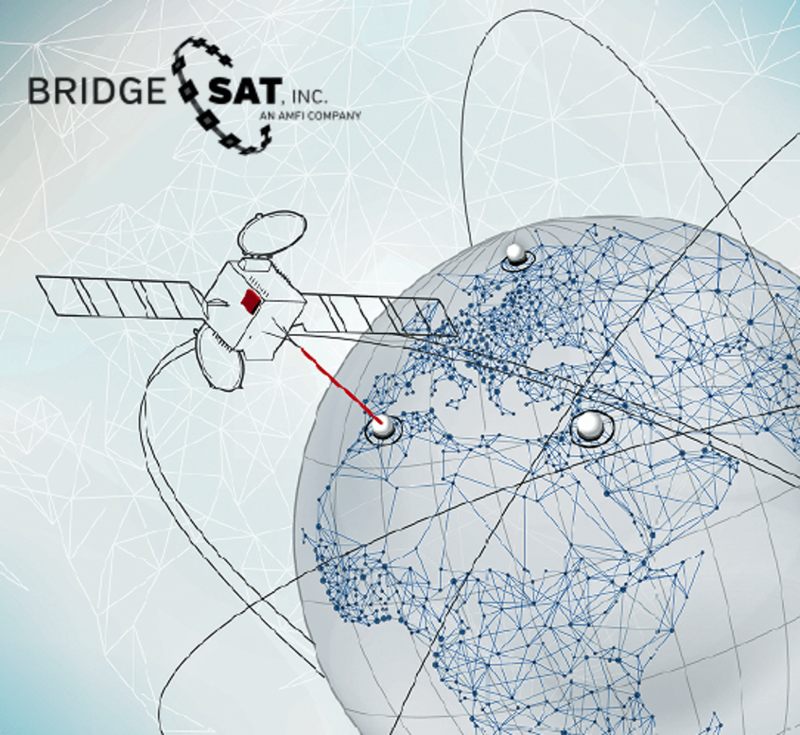 BridgeSat is working to bring optical communications capabilities to a new generation of satellites. BridgeSat, a subsidiary of Allied Minds Inc. and a Space Angels-funded venture, is creating a turnkey optical communications solution for satellite manufacturers and operators. BridgeSat’s service features a couple of key components. Firstly, the company designs and builds customized laser communications packages to be affixed to customer satellites, thereby equipping customer assets with optical downlink capabilities. Per David Mitlyng, Senior VP of Business Development and Strategy at BridgeSat, these in-space terminals are designed to transmit data at rates up to 2.5 Gbps, with a planned expansion to 10 Gbps transmission in the future. The other aspect of BridgeSat’s service is the terrestrial component. Optical communications essentially rely on high-powered beams of light, and as such must take precision aim at ground stations in order to reliably transmit data. In order to ensure that customer data is received, BridgeSat is developing a global network of ground stations for laser-equipped satellites. This network of ground terminals will be made available on a per-bit basis to all space-based optical communications assets, regardless of manufacturer or origin. In September of 2017, BridgeSat announced that they have partnered with legacy optical communications provider Tesat-Spacecom. This partnership will demonstrate how BridgeSat’s ground network can be used by existing laser communications terminals, and serves as further validation of the value that BridgeSat brings to the growing optical communication marketspace. Analytical Space is creating the world’s first high-throughput laser data network in low-Earth orbit. While BridgeSat is working to establish a global network of optical communications ground stations, Space Angels-funded startup Analytical Space Inc. (ASI) is developing a relay network of laser-equipped CubeSats in LEO. ASI is focusing its service on Remote Sensing and Earth Observing satellite operators—a subsegment of the broader satellite market which saw 11% growth in global revenues over the course of 2016 (SIA’s State of the Satellite Industry Report, June 2017, p. 14). ASI’s unique CubeSat network will triple data throughput for remote sensing satellites, at half the cost of currently available alternatives. Since nearly all active satellites utilize RF communications, a crucial aspect of ASI’s value proposition is the cross-compatibility of the service offered. ASI’s laser downlink relay can be employed by satellites already deployed in orbit, regardless of whether the assets have been equipped with optical communications payloads. ASI’s hybrid CubeSats are capable of receiving data from customer satellites via RF transmitters, before transmitting that data to Earth using lasers—effectively providing customers with the benefits of optical communications with zero hardware investment. ASI recently raised $3.5 million in seed funding, which will go towards deploying the company’s first “pilot” satellite in Q1 2018. ATLAS is developing the first commercially-available deep space communications relay. Another startup offering solutions for both RF and optical communications is Space Angels-funded ATLAS Space Operations. 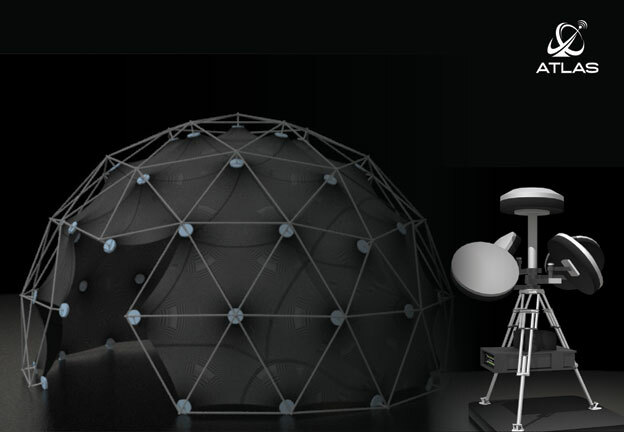 ATLAS is building a global network of satellite ground stations to provide customers with on-demand access to their space-bound assets—and through a partnership with fellow portfolio venture Astrobotic, ATLAS will demonstrate the practicality of its optical communications terminals as well. When Astrobotic sends its Peregrine lander to the Moon in 2019, it will carry aboard ATLAS laser terminal in order to bolster Moon-to-Earth communications and data throughput for other customer payloads. As optical transmissions become a commercially-viable alternative to RF communications, startups are working to bring lasers to the satellite market. There are many reasons why the space industry is considering making the move from traditional radio frequency communications to laser-equipped satellites. 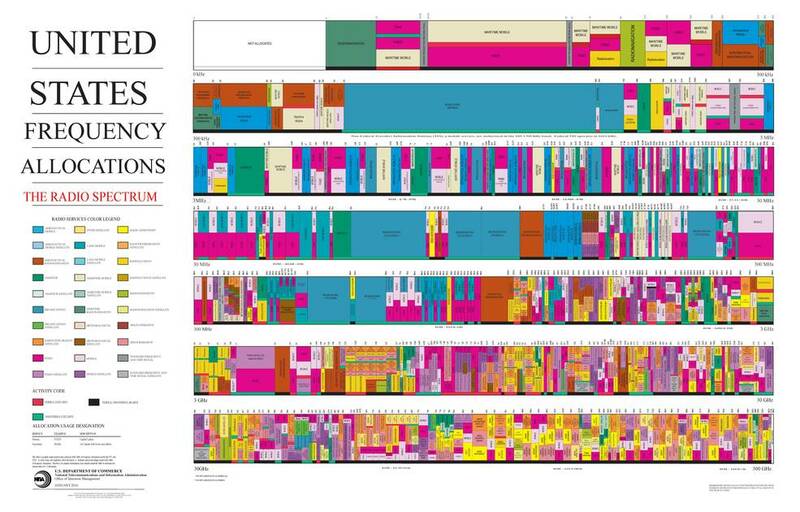 For one thing, the RF spectrum is heavily regulated, requiring lots of complicated oversight to navigate. It’s quickly becoming more crowded as new players and applications enter the industry (especially with an influx of new commercial interests, like SpaceX and OneWeb). Traditional RF communications are also subject to inherent drawbacks like latency issues and bandwidth limits. As the needs of the space industry evolve, it’s becoming clear that lines of communication between space and Earth must evolve as well. As a new generation of satellite startups work to bring their novel optical solutions to market, savvy investors are recognizing the potential of laser communications. The satellite industry is booming, and optical communications may well be the in-space technology of the future.